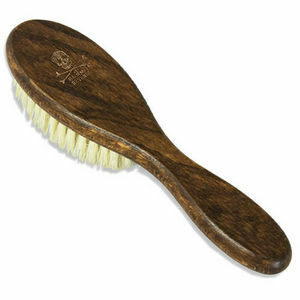 An extra soft brush with extra soft boar bristles. The Bluebeards Revenge Fade Brush has extra soft boar bristles that provide a gentle way to remove cut hair so that you can check your work as you go. It's a perfect tool to assist with intricate clipper fade cuts. It's also a great brush for styling more tender scalps or fine hairstyles. Maroon barber's gown that is water-repellent and machine washable in a lightweight, breathable fabric. Dimensions: 130 cm long x 160 cm wide.